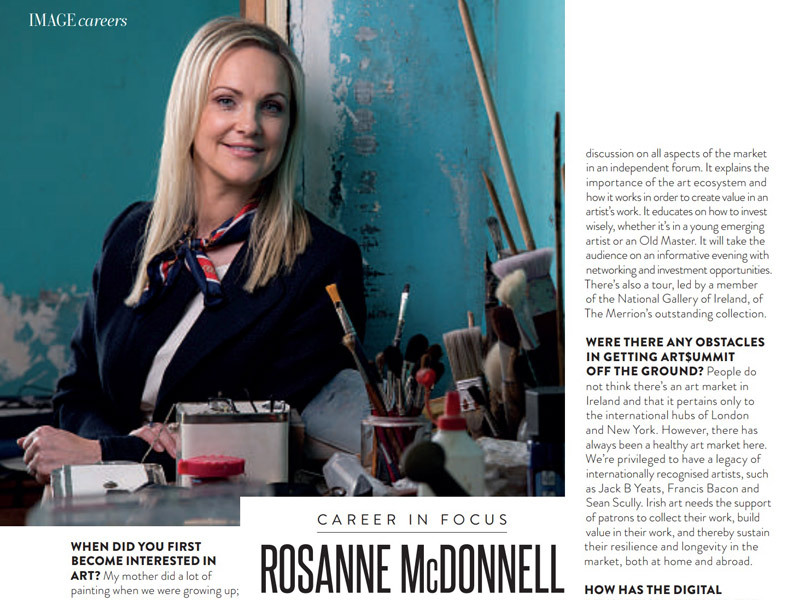 In the lead up to the Art Business Summit 2017 Rosanne McDonnell spoke to Meg Walker from Image Magazine for a Q & A for their Careers in Focus section. Q: WHEN DID YOU FIRST BECOME INTERESTED IN ART? A: My mother did a lot of painting when we were growing up; being surrounded by her creativity was a big influence. My best friend’s parents were also artists. I have fond memories of her dad, Dieter Blodau’s studio. We’re still great friends, and Dieter has an exhibition celebrating his 80th birthday at Limerick’s Hunt Museum in December. I merged art and law when I became more established in my legal career. At present, there is no formal education in Ireland that specialises in art law and art business. I realised I had to travel, so attended conferences in London, New York, Switzerland and various parts of Europe. I immersed myself in understanding the legal and business challenges that faced these markets and adapted them to the Irish situation. It wasn’t long before I started to build a network of experts both within Ireland and abroad. You can download a PDF of the full article from Image Magazine here.